emily francisco: may i have the piano delivered to you? may i have the piano delivered to you? MAY I HAVE THE PIANO DELIVERED TO YOU? was a studio residency and evolving installation in the AIR Studio at Artisphere in the Rosslyn District of Arlington from August of 2013 until April of 2014. THE EXCHANGE is the summary of an interaction: a baby grand traded for a small remembrance of that piano. This video summarizes the slow dismantling of that object in order to fulfill a commission by Maureen Booth. The piano was once an heirloom belonging to Maureen's late husband, Walter, and it was donated to the artist for the purpose of creating new sculptures. 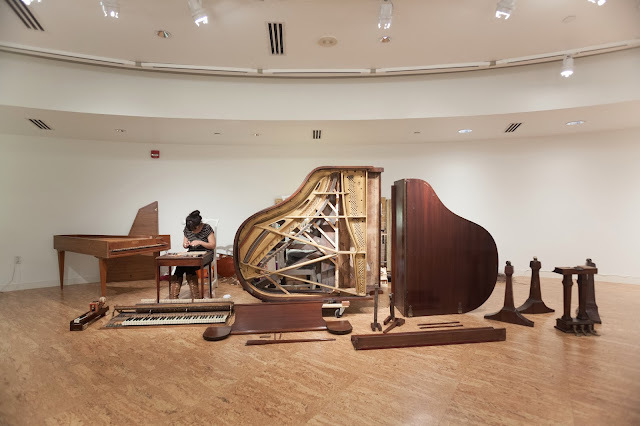 Preliminary deconstruction took place at the American University Museum in Washington DC as a three-week-long performance between April and May of 2013. The pieces were moved to Artisphere for further development in August of 2013. The small musical sculpture in this video was built and shipped to Walter's sister, Susan Custis, thus completing the exchange. The remainder of the instrument is still being processed into new works. THE TOY KRANICH AND BACH is a toy piano built with pieces of the piano donated by Maureen Booth. The toy piano was completed on April 6th, 2014 -- the final day of the studio residency at Artisphere.